After seeing three hours of Stargate Universe, I’m very impressed. According to Wikipedia, the “industry” (whoever they are) has dubbed Stargate Universe as “dark and edgy”, a sentiment I would agree with. It’s a solid show and I’ll continue to watch. So far I’ve only seen the pilot and the first episode. After seeing just the pilot, I felt it was incomplete and I wasn’t totally vested in the series. While I enjoyed the concepts, it just didn’t feel right. I chalked it up to new series jitters, but wasn’t sure I’d be coming back for more. Then I watched the first episode. Now I would recommend any new viewers watch the pilot and the first episode together. The pilot is entitled “Air” Parts 1 & 2, the first episode is entitled “Air” part 3. After seeing “Air” part 3 it all came together for me. Together it’s a complete story that encourages the viewer to come back for more. Being a self-respecting Geek, I simply have to find things to pick apart about the show. 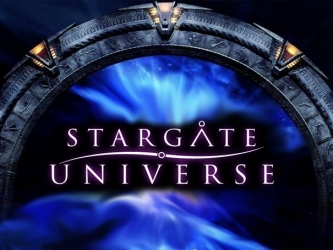 First, the show doesn’t feel like any previous Stargate series. I jokingly refer to Stargate Universe (SGU) as “Stargate Galactica” with my friends. The series creators appear to be going for the high-drama, super-high-tension, claustrophobia, shaky-cam, and folksy music from the recent Battlestar Galactic series. That isn’t a bad thing, it’s just a big departure for Stargate. Second, I find it ironic that the Stargate franchise has followed Star Trek’s path pretty faithfully. Stargate SG1 = STNG (new planet each week); Stargate Atlantis = DS9 (fixed location deep in space); and Stargate Universe = Voyager (Lost in Space formula). I guess that means the next Stargate series will be a prequel. Maybe it will be about the Stargate program of the 1950s. Given the Lost in Space aspect of SGU, Dr Rush is totally Dr Smith. He’s also got some Gaius Baltar in him. I like to call him Dr. Gaius Smith. Third, while I like the character of Eli, it’s a little too obvious what he’s supposed to represent. He represents two things: (1) the humor of the previous Stargate series, and (2) he’s supposed to be our geek-window into the show. My guess is that some producer thought us geeks wouldn’t associate well enough with the characters, so they added someone like us in the show for us to relate to. Again, I enjoy his character, but it feels a bit forced. Fourth, I find nearly all the characters on the show interesting, with the exception of Chloe. She doesn’t do anything for me and is already grating on my nerves. I’m usually pretty accepting of characters. I even find Lou Diamond Phillips character and the Dr Rush character interesting. Both are jerks and I wouldn’t want to hang with them in real life, but on the show they are fascinating characters to explore. Chloe… nothing, nada, zip. Hopefully she’ll become more interesting, or fall out an airlock. That’s really all the griping I’ve got. I really dig Colonel Young, the commanding officer. His willpower and presence is inspiring (and he looks like Stallone – cool!). I also like Lt. Johansen, the field medic. She’s tough and interesting. I think her character has lots of potential. The ship itself, Destiny, is really interesting and I look forward to learning more about it. In conclusion, I like the show and will watch more. I need to catch the two more recent episodes over on Hulu. This post began life as an e-mail to my friend, Ed. Thanks Ed for inspiring this post! I was really disappointed after watching the first hour, but I didn’t give up on the show quite yet. I came back for more punishment. I watched part 2 of Air, but didn’t make it all the way through. After about 30 minutes, I had to turn off the TV and walk away. This program is without a doubt one of the worst shows I’ve ever seen. I’m a big BSG and Stargate fan, but this is one show I won’t ever watch again.